RSMSSB Aganwadi Supervisor Answer Key Check Here. RSMSSB Aganwadi Supervisor Admit Card Check Here. RSMSSB Supervisor Exam Date Notice Check Here. RSMSSB Supervisor Admit Card 2018 Check Here. RSMSSB Supervisor(Female) Exam Notice Check Here. RSMSSB Notification is out. 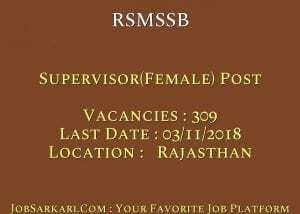 RSMSSB is recruiting for 309 Supervisor(Female) 2019 Posts. You can check RSMSSB - Rajasthan Subordinate and Ministerial Service Selection Board last date, download RSMSSB notification, visit RSMSSB official website and check other RSMSSB Vacancy details.Complete Vacancy and recruitment Details about 309 Supervisor(Female) 2019 vacancies in RSMSSB are provided below by JobSarkari.Com only for you. Last Date for Apply Online 03/11/2018. Last Date for Payment of Fee 03/11/2018. General / OBC / EBC Rs.450/-. OBC / EBC (NCL) Rs.350/-. Candidate Must Have Passed Graduation With 10 Years of Experience as Anganwadi Worker in ICDS or Having DOEACC Certificate or CCC Certificate or COPA Certificate or Degree / Diploma in Computer Science / Computer Application or RSCIT Certificate. Age Relaxation Upper Age Limit is Relaxable by 05 Years for SC / ST / OBC / EBC / Female Candidates. 6.Online Application Can be Submitted on or before 03rd November 2018. Q. 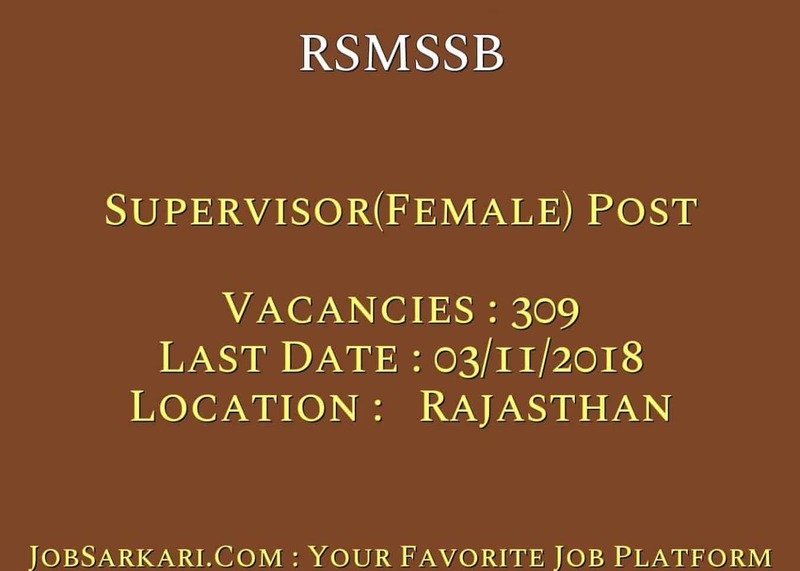 What is the Last Date For RSMSSB Supervisor(Female) 2019 Vacancy ? A. Last Date for RSMSSB Supervisor(Female) 2019 Posts is 03/11/2018. Q. What is the Form Type of RSMSSB Supervisor(Female) 2019 Recruitment ? A. The Form Type for RSMSSB Supervisor(Female) 2019 Posts is Online. Q. How many vacancies are available in Rajasthan Subordinate and Ministerial Service Selection Board Supervisor(Female) 2019 Posts ? A. There are about 309 Vacancies in Rajasthan Subordinate and Ministerial Service Selection Board Supervisor(Female) 2019 Posts.